The author of this mind-bending thriller discusses quantum mechanics, Chicago, and the sci-fi he's reading right now. After I started reading Dark Matter, I didn’t do anything else for 24 hours except turn the pages. The fast-paced, relentlessly surprising sci-fi thriller kept me guessing and enthralled, even though I’m not a die-hard sci-fi fan. Blake Crouch’s novel, now out paperback, is multi-layered and has something for everyone: quantum mechanics, but also heart-pumping suspense and a touching love story. For the uninitiated, Dark Matter explores the idea of paths not taken and asks the question “are you happy with your life?” as it relates to protagonist Jason Dessen. Jason, once a physicist with a promising career left his research career after his girlfriend became unexpectedly pregnant with their son. He chooses to marry his girlfriend and leaves behind his groundbreaking research for a quieter life as a professor and father. But when Jason is kidnapped by a masked man and wakes up to find himself in a different life than the one he left—he’s single, childless but has an extremely successful career—he questions how he got there and how he can get back to his family. Crouch, the mastermind behind the Wayward Pines trilogy (which was adapted into a prime-time event series on FOX), is getting another crack at seeing his work on the screen—he is writing the movie script for the Dark Matter movie, which Roland Emmerich is in talks to direct. Read (and watch!) 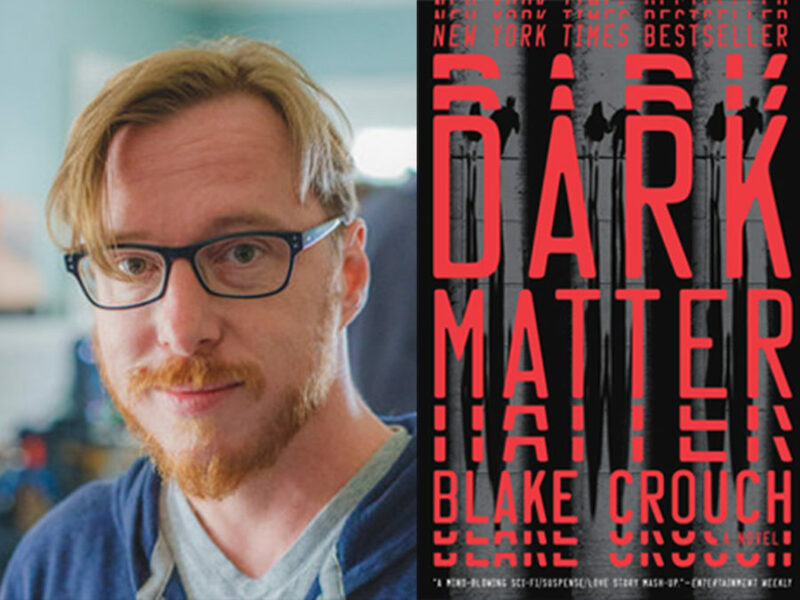 Blake Crouch on how he stumbled upon the concept for his novel, the science behind it all and how he altered the city of Chicago to suit his needs. Read It Forward: Hi, Blake. First of all, may I just say, Dark Matter absolutely blew my mind. RIF: Where did you get the idea for the plot? BC: I had been trying to write Dark Matter for ten years. I had three different desperate ideas that were all bouncing around in my head and I’d tried to write each of them at one point in time or another. Two years ago, I was in Chicago hanging out with a novelist friend of mine named Marcus Sakey, and we were just talking, having this sort of brainstorm session, and I realized, oh, all these separate ideas are all parts of the same big book, and it’s Dark Matter. After that, they all just clicked together like a puzzle piece. RIF: That’s some good brainstorming! RIF: The quote “Are you happy with your life?” is the last thing your main character Jason hears before his masked abductor wipes him out. What are you exploring through Jason about the concept of what makes us happy? BC: Jason has this really good life. He isn’t wildly happy. He’s not sad. I think he’s just medium, like most of us. But he has these regrets, and occasionally at night, lying in the dark, he thinks, well, what if I had stuck with my research; what if I had taken a different turn in my life? I think it’s something that we all wrestle with. I’m 37 years old, and I definitely am reaching this point in my life where I’ve lived enough years that you see the choices you made a long time ago are really coming to fruition now—some great, some not so great. And Jason and his journey seemed like the right vehicle for me to explore those questions. What does life look like at the end of the road not taken? 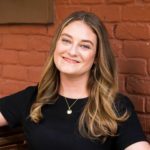 RIF: There’s a contrast that you’re making between being so career-crazed that you ignore personal relationships and choosing a path where you might not be considered a rock star in your field, but you’re more satisfied personally. Is this a statement about our workaholic culture and did you draw anything from your own personal experience? BC: In retrospect, I guess it is a statement about our workaholic culture. And there’s a bit of therapy of my own in this book. I’ve been on a pretty busy tear for the last few years. 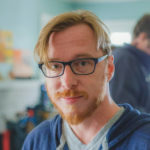 I am a father of three, and I often feel the tension between a need to do a million things versus a need to spend time with my kids. And I want to spend time with them! It’s the tension between those two that really put me down the path of this book. It’s so easy to get locked into only thinking about the future and the present just zooms right by, and you never savor those moments. Watch Blake Crouch discuss his writing style. RIF: How do you, as a writer, balance the scientific explanation and theory with the pressure to move the story along—especially when you’re dealing with time and ticking clocks? BC: That was honestly the hardest part of writing this book and why, aside from not knowing what the story was, I put off dealing with the quantum mechanics for so long. It’s a very dense field of science, and while I was absolutely positive there were some amazing gems underneath the surface, to dig down through the intense, incomprehensible equations and theories and to try to present something that at its core is about subatomic particles but make that relatable and show how that actually matters in our day-to-day life, that was the hardest part of writing this book, and the research was pretty life-consuming for a while. RIF: [Laughs] I bet. Did you lay out the plot and then go back and fill in what the reader needs to know to understand this in terms of quantum mechanics? BC: In the first draft of the book, I just put everything in that I wanted. When you’re doing the research, you’re so excited about what you’ve learned, the instinct is to just share everything with the reader. It’s a total overshare moment like when you’re at a party and someone just tells you way too much information. The first draft of this book was that. BC: TMI on the quantum mechanics. I just fell asleep. But as I worked with my editor, each draft got better and better in terms of pulling out the threads of science that weren’t really necessary and just leaning into the core theories that supported the story structure. RIF: Do you think that when we each make decisions that alter our life path in some way—that the alternate scenarios get played out by different versions of ourselves—or is that just science fiction? BC: It is a somewhat respected theory in quantum mechanics. It’s called Everett’s many-worlds theory, and it presents the idea of the multiverse, wherein each choice we make, each thought we have, does give birth to another universe. The idea is that, yes, these realities continue to play out, whether you order eggs or pancakes at breakfast, you continue to live in the world where you ordered eggs. The other version of you continues to live in the world you ordered pancakes. RIF: I felt safer when I thought you made it up, but okay. RIF: Do you ever play the what-if game in your own life, thinking about where you might have ended up had you made different decisions? BC: Absolutely. I think everyone does. That’s why I wrote this book. I think often about how I tried to get into law school right after college, and I didn’t get in. At the time, I was crushed. My self-esteem was devastated, but now I’m so, so, so happy I didn’t because that would have taken me on this path that would have been all about being a lawyer and not writing and not storytelling, and it’s scary to me to think that there is another version of me that did get into law school, and he’s out there, you know, writing legal briefs, or doing speeding tickets or DUI courtroom things. That’s just not how I imagine my life. I always knew I was a storyteller, and it’s scary to think that there’s a version of me out there that isn’t doing what I love to do. RIF: Without giving too much away, the ending of the book surprised me in a good way. RIF: How did you decide to take the ending in that direction, and did you play with alternatives? BC: It was fascinating. I thought I had the end of the book all figured out as I was going into the midpoint. I finally got there and I realized it wasn’t quite working. It wasn’t exactly what I wanted. And I was like, what happened here? So, I went back to my notes, and I started thumbing through them. I saw, like literally the third or fourth day I was beginning to take notes for the novel, I had dashed off this one sentence, without spoiling anything, which said what the big twist is going into the last hundred pages. It made me smile ‘cause it was like, oh, I always knew what the end was, I just had forgotten it, and it made me very happy I had written it down. RIF: Always take notes, right? RIF: As a reader, the entire book felt very cinematic to me. I could see the steps he’s walking down with the attacker. I could see the empty warehouse. I could see the streets of Chicago. Is that something that you’ve picked up after seeing your trilogy, Wayward Pines, on the small screen? BC: I think I was always a cinematic writer. I see a book unfolding visually as I write, and I’ve always seen it that way. In my first few novels, the prose was wordier. There was more fat on the bones in a bad way. It wasn’t as easy to read. It was always very visual, but now with this developing style that’s more pared down, the visuals pop even more. You’re not throwing so many details at the reader. You’re throwing like three or four choice things to help really paint that scene in the reader’s mind. RIF: Okay, so here’s a question for you. When Dark Matter is a movie, what do you hope they keep or represent well? BC: I’m writing the script for it, so I’ll have no one to blame by myself. I want the spirit of the book to carry forward into the film. They’re two very different mediums. And things have to get lost, otherwise, it would be a 20-hour movie. I like the condensation process of making something more streamlined. You boil a script down to this hard diamond of the story. As long as it keeps the spirit and the characters stay the same, that’s really all that matters to me. Hear Blake Crouch talk about how he altered the city of Chicago slightly to fit his novel. RIF: Changing direction, what books are you reading right now? BC: I am reading a really cool book called Three Years with the Rat by Jay Hosking and I just finished reading Sleeping Giants by Sylvain Neuvel. It’s one of the most fun sci-fi books I’ve read in a long time. RIF: Are you strictly a sci-fi fan? BC: Oh, no, I read all over genre. Occasionally nonfiction and, you know, articles about quantum mechanics. Want to start reading Dark Matter? Click here to read the first chapter!